While credit obviously needs to go to Zeno of Citium for coming up with the philosophy, it was legendary Roman emperor Marcus Aurelius (you might remember Joaquin Phoenix murdering him in the first few minutes of Gladiator) who did the most by compiling all Stoic thought into a comprehensive and concrete tome. To this day, Marcus Aurelius’s Meditations serves not only as the be-all-end-all guide to Stoicism but as inspiration to philosophers, writers, and world leaders. Life, most Stoics would argue, is like a river with a strong current. Regardless of how hard you paddle against it, you’re going to be pulled inexorably along to the end and there’s nothing you can do to change that. The only thing you can do is decide whether or not you’re going to handle it with good grace and dignity. 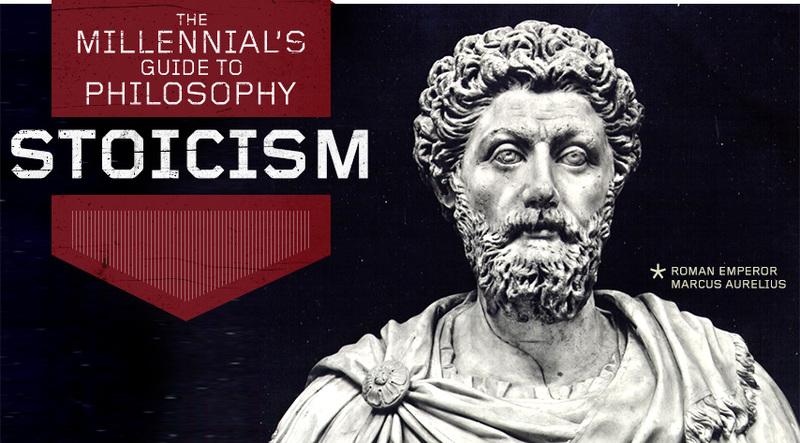 Hardship, pain, suffering, and ultimately, death – these are all parts of life that Stoicism would consider as natural as they are inevitable. Taking a highly fatalistic approach to all of existence’s trials and tribulations, both philosophies maintain that since you can’t exercise any control over them, you should instead spend your time in the struggle to control yourself. This is where the term “Stoic”, in reference to indifference to hardship, originates. It’s the mentality that all of life’s ups and downs should be taken in stride. Well, that’s where discipline comes in. For all our glorification of Stoic ideals, from John Wayne and Humphrey Bogart to Captain America and Ron Swanson, we’re nevertheless left with some pretty big shoes to fill here. And if taking a beating from the universe with a smile on your face and a spring in your step doesn’t sound like your idea of a good (or sane) life, then this particular worldview probably isn’t for you. Of course, even the most dedicated devotee of Stoicism will tell you that just because something isn’t easy doesn’t mean that it isn’t right. That is the core essence of Stoicism: the belief in the existence of things greater than pleasure or pain – that a man who is driven through life by the fear of the inevitable never truly lives. In the tough times after college the idea that you can rise above all the petty worries and woes has got to be something that resounds with each and every one of us. As good a place as any to get started is the development of your code: a set of personal and absolute values which surpass in importance everything else in the world (in fact, Primer’s own Andrew Snavely has a great article on doing just that). A personal code isn’t just about showcasing what your values are, either – it’s a measurement system for how close you can get to living out your beliefs (or how far you stray). This is all the more important in your 20s, when it’s easy to get overwhelmed with the loss of the sense of direction that college once offered. Being able to roll with life’s punches isn’t about being apathetic to hardship or ignoring its existence, but in fundamentally understanding that there exist things in life beyond your scope of control, that you can either stress about the things you can’t change or devote yourself to the things you can (yourself being first and foremost on that list). We’re talking about a reasonable philosophy created to not only make sense in an unreasonable world, but to help the adherent overcome it. And if that’s not a place to start, I don’t know what is. Meditations by Marcus Aurelius – As stated above, Meditations has become the epitomizing work of Stoic philosophy. Aurelius’ simple observations on life and humanity, while written solely for himself, have proven cuttingly insightful for countless individuals over the course of the centuries. The Enchiridion of Epictetus by Arrian of Nicomedia – A Stoic text predating even Meditations, The Enchiridion serves up helpful metaphors and maxims on delayed gratification, self-control, moderation, and acceptance. Analects by Confucius – Although separated by over 5,000 miles, the philosophy of Confucianism developed at roughly the same time as Stoicism and, with few a exceptions, overlaps almost perfectly with its Western counterpart. Similarly emphasizing obligation, humility, self-discipline, and the temporality of all things, Analects makes a perfect companion piece to any study of Stoicism. Awesome post! Please tell me there will be more! After all this years philosophy finally makes sense. Great post Gordon! Like everyone else in here I hope we see more articles like this one… maybe a “must read” book list? Solid article and an interesting topic. I just bumped Meditations higher up on my to-read list. I’d also suggest “Letters from a Stoic” by Seneca, an adviser of the Roman emperor Nero. fantastic. helps me read the map. I would also recommend “The Art of Living” by Epictetus, considering Epictetus was a great influence on Marcus Aurelius. Nice post! I’m still reading through Meditations and even the introduction have taught me a lot about life.